The Nabisco Yamazaki Cup began yesterday on a National Holiday in Japan for the Spring Equinox. This cup competition is the equivalent of the League Cup (currently sponsored by Carling) in England. The first stage has 14 teams divided into 2 groups and works in a league format. Japan's representatives in the Asian Champions League receive a bye in this stage and will go straight into the quarter finals. 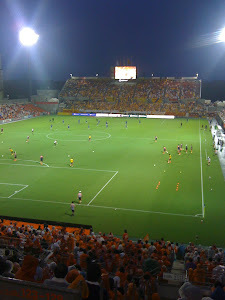 Omiya Ardija entertained Yokohama F Marinos at Omiya's home stadium of Nack 5 for a 4pm kick off. Omiya took an early lead in the 15th minute through new Brazilian defensive midfielder Carlinho. A long pass to Rafael who quickly crossed the ball which eventually came to Carlinho who confidently stroked the ball home. His double somersault celebration was a sight to be enjoyed by the Squirrels fans. His performances so far have been very encouraging and the fact that he has now shown an ability to score is even more promising for the rest of the season. A Yokohama F Marinos side including ex Celtic midfielder Shunsuke Nakamura fought back in the second half and eventually found a way through Kitano's goal. The equalizer was scored by Manabu Saito in the 84th minute. It was mostly an even match with both teams playing some nice football. Yet again, Omiya were guilty of missing chances which if taken would have put the game out of reach of the Marinos. By far the best example of this was in the second half when a lovely ball from midfield split the Yokohama central defenders and Cho was through on goal with only the keeper to beat but he chipped the ball not only over the oncoming keeper but alas also over the bar. The equalizer from Saito had both elements of luck and skill, and also highlighted the freedom Ardija defenders will sometimes give to opposing attackers around the penalty area. The ball came to Saito and he found himself with the time and space to craft a wonderful right footed shot on goal which curled on to Kitano's left hand post, rebounded onto the unfortunate Ardija keeper and into the net. Ardija therefore had to settle for a point in their first game in the Nabisco Yamazaki cup, when their overall performance could have won them more if they had been sharper in front of the Marinos goal.